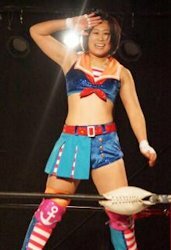 Konami is a rookie Freelancer, officially debuting in February of 2015 after having an exhibition match in October of 2014. Konami is the young protege of Kana, and imitates her offensive style with submissions and kicks. Konami is not the largest wrestler but plays a good underdog and is extremely smooth for a wrestler that only officially debuted four months ago. In her short career she has wrestled in Kana Pro (Kana’s own produced events), and also is taking part in the Catch The WAVE Young OH! OH! Tournament for rookies. Konami also wrestlers for REINA. Only officially a few months into her career, she is definitely one to watch. For more information on Konami, you can follow her on Twitter @k_o_n_a_m_i as well as on her blog. For more detailed information, check out her profile over on Puroresu Central. I leave you with her debut match against Kana, check it out.